Embarking out of Newport Harbor California, Bongos Sportfishing offers a variety of fishing excursions to Catalina, San Clemente Island or the open ocean in search of the area’s finest fish. Our staff of experienced professionals will assist and can accomidate the inexperienced or most advanced anglers. Bongos Sportfishing has been running 6 pack fishing charters out of Newport Beach for over 25 years. Bongos III is our 38’ Tiara Express, powered by twin Cummin turbo diesel engines that cruise at 22 knots. This fishing machine is rigged with state of the art electronics, a galley with microwave, private head, full bed with additional bunks, all required safety equipment, plus a professional crew and certified captains who will take you on a trip of a lifetime. 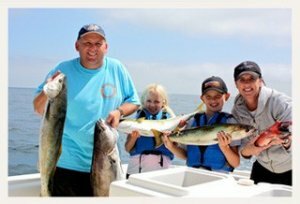 We specialize in overnight and three-quarter day fishing trips taking guests to Catalina or San Clemente Island in search for some of the area’s finest fish. Depending on the season, guests can catch a wide variety of fish including Yellowtail, White Seabass, and Calico Bass. We also have the speed to head offshore in search of Tuna, Dorado, and Yellowtail within in a 3/4 day trip. Bongos is armed with top of the line Shimano fishing equipment which is available to all of our guests. On Bongos we respect the ocean and everything that comes out of it. Fish caught are either released unharmed or taken care of promptly to ensure the freshest quality possible. No experience is needed, our staff of professionals will assist and educate you on everything you need to know to become Southern California fishermen. Come fish with Bongos and see why we have a five star reputation.